Peel and chop Mango into cubes. I have always used a potato peeler to peel off the skin from the Mango because I found that it was much easier for me. Wash Spinach and your salads thoroughly and drain. Take a large bowl and start by adding the spinach on the bottom, then continue with a layer of Iceberg, Romaine, Carrots. Add in the Mango, Chicken, Olives. 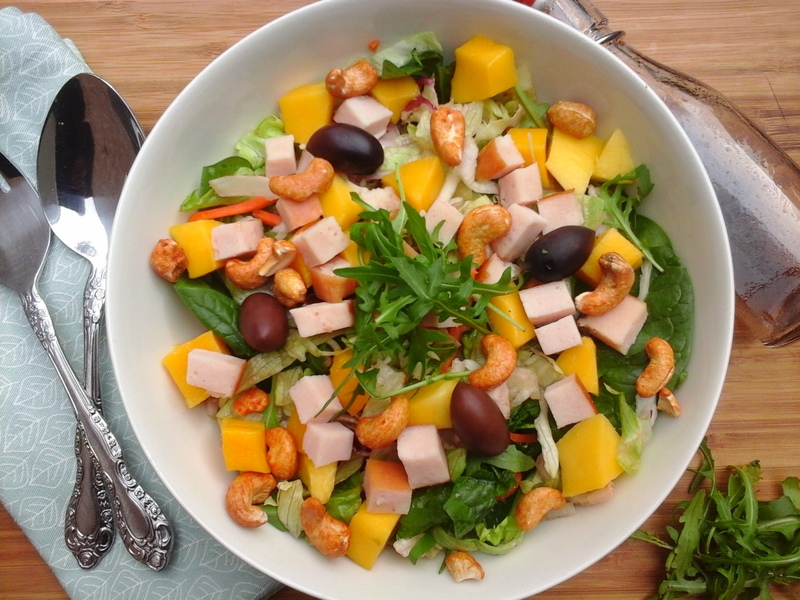 Top with a bit of Rucola and Olive Oil and of course Cashews to get a bit of crunchiness from your salad and or any dressing topping that you like and enjoy this fantastic salad. If you are looking for a delicious, colorful healthy salad for Lunch or Dinner try out this recipe.